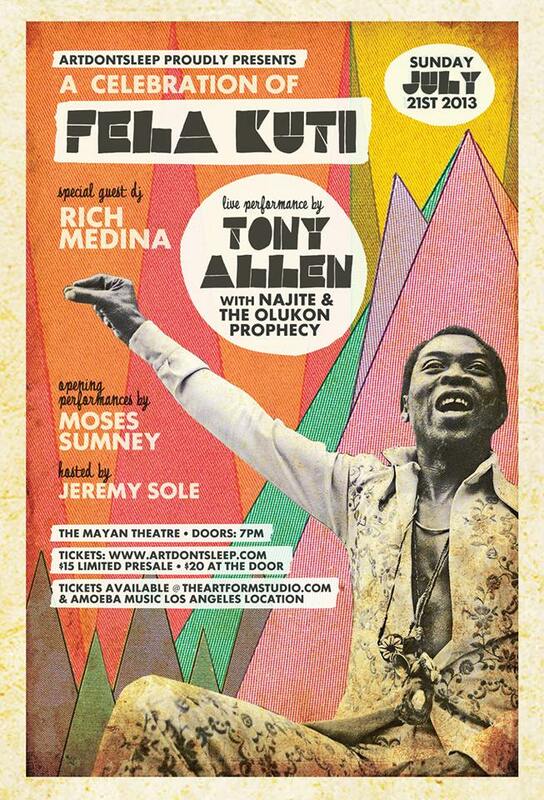 The Fela Kuti Celebration with Tony Allen, Rich Medina & more! If you Love Fela Kuti and Live in California, this is your chance to be a part of a truly special celebration of Afrobeat. If you live in San Francisco, Fresno or Los Angeles, please be sure to be part of one of these epic and legendary nights. Today living in Paris, Allen has long been acknowledged as Africa’s finest kit drummer and one of it’s most influential musicians, the man who with Fela Anikulapo Kuti created Afrobeat – the hard driving, James Brown funk-infused, and politically engaged style which became such a dominant force in African music and whose influence continues to spread today. Koola Lobitos, formed in 1965, played a mixture of highlife and jazz. A few years later, at the urging of funk musicians including Bootsy Collins and other members of James Brown’s band they met on tour in the US, Kuti and Allen simplified things further. “One idea, one song” became the Afrobeat paradigm). In 1969, Koola Lobitos made an extended visit to the US, where they lived a hand to mouth existence. “The living conditions were rough,” says Allen. “We started on the east cost, where there were lots of Nigerian students, and we did well there. Then we went west, via Chicago, to San Francisco and Los Angeles.” Audiences, which were still largely composed of Nigerians, grew smaller. “Fela got fed up just playing to Nigerians. He said if we were going to play to Nigerians, we might as well do it in Nigeria where there were a lot more of them.” The Koola Lobitos album The ‘69 Los Angeles Sessions, made on the hoof towards the end of the tour, documents the emergent Afrobeat style of the band. Kuti’s political consciousness, nurtured by his politically active parents back home – and soon to become a defining feature of Afrobeat – was sharpened in the US, where he befriended a black American woman called Sandra Isidore. A member of the Black Panthers, Isidore introduced Kuti to the ideas of such people as Malcolm X, Angela Davis, the Last Poets, Stokeley Carmichael and Eldridge Cleaver, all of whose thinking played some part in the development of Kuti‘s own political philosophy, Blackism. Once back in Lagos, Kuti renamed the band Africa 70 (it had in the US briefly been Nigeria 70, and was later tweaked to Afrika 70). With Allen forging the music’s vibrant signature rhythms, and Kuti its incendiary lyrics, the duo had, within a few years turned Afrobeat into a style rivaling the then reigning juju and highlife in popularity. “Fela said I sounded like four drummers,” says Allen. “I was the only one who originated the music I played.” Fela used to write out the parts for all the other musicians. If Allen sounded like four drummers, it could have been because, in his mature Afrika 70 style, he was drawing on four different styles – highlife, soul/funk, jazz and traditional African drumming. A unique and mighty sound. (In 1970 when James Brown played in Nigeria, his arranger made careful study of Fela’s band and Allen’s drumming in particular, as did Ginger Baker, another disciple). In 1975, Allen recorded his debut album, ‘Jealousy’, the first of three made with Afrika 70 and produced by Kuti. ‘Progress’ followed in 1976, ‘No Accommodation For Lagos’ in 1978. But by 1978 he was ready for a change of scene, and a year later he parted company with Kuti. The touring entourage had grown to outlandish proportions and there was talk of him not getting due respect or recompense for the contribution he had made to the creation of Afrobeat and the success of Afrika 70. “It’s not a big story,” says Allen today. “I was tired, I’d just had enough.” His final studio collaboration with Kuti was on an album made with American vibraphonist Roy Ayers, ‘Africa Centre Of The World’ (released in 1981). In 1979 he formed his own band, Tony Allen and the Afro Messengers, and recorded his first album away from Kuti, ‘No Discrimination’.